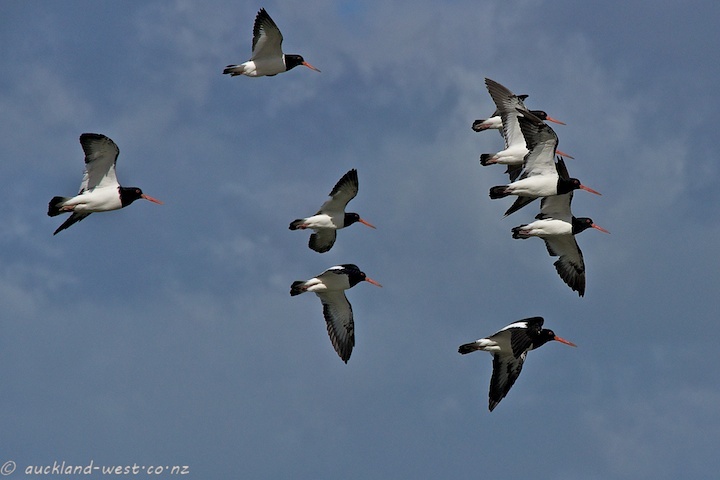 Yesterday at Titirangi Beach, a flock of South Island Pied Oystercatchers flying from one side of the beach to the other. 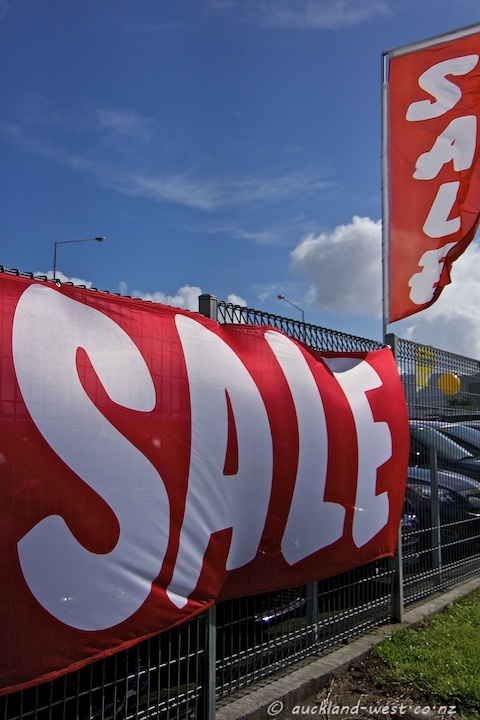 Banners bulging and flags fluttering in the breeze. 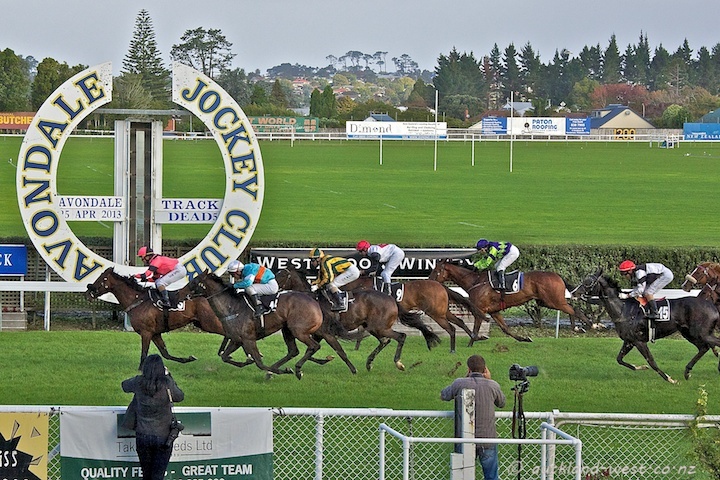 Avondale Races are usually during the week and have not many spectators. This was last Thursday, Anzac Day afternoon, and because of the holiday there was quite a crowd. 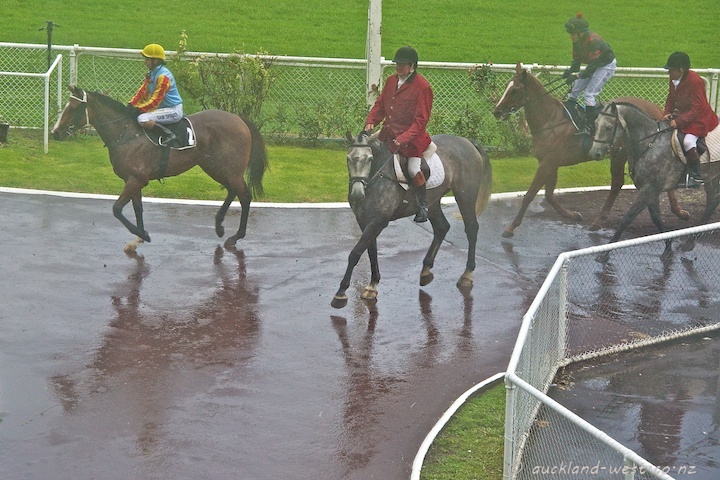 The weather was a mixed bag of sunshine and showers. 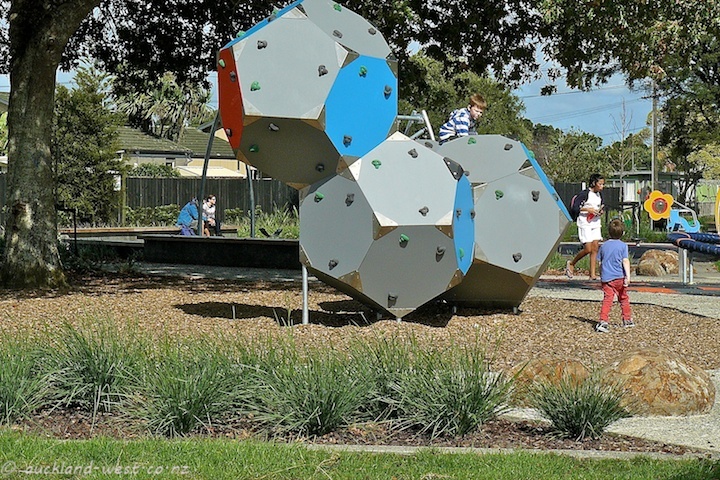 Kuaka Park playground has emerged from the former Saxon Reserve in the course of the upheavals of the Waterview Connection of State Highway 20. 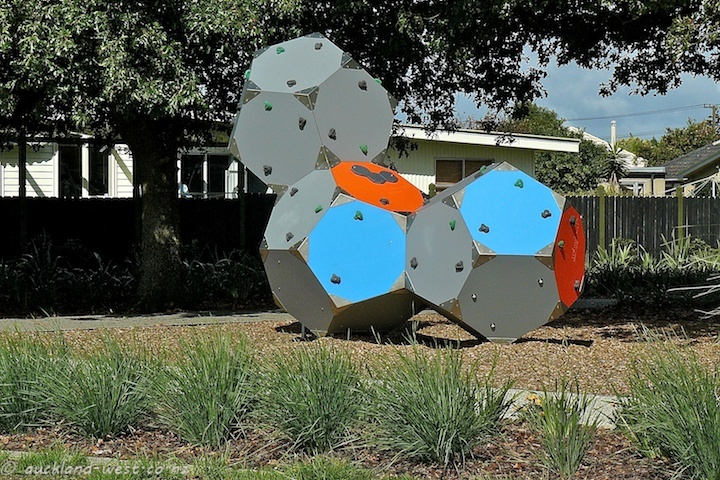 Climbing structures assembled from dodecahedral shapes. Kuaka is the Maori name for the godwit (limosa lapponica), a migratory bird which visits New Zealand during our summer and then returns to Alaska to breed in their summer. (It is unlikely that a godwit has ever been seen in the closer vicinity of the park…). 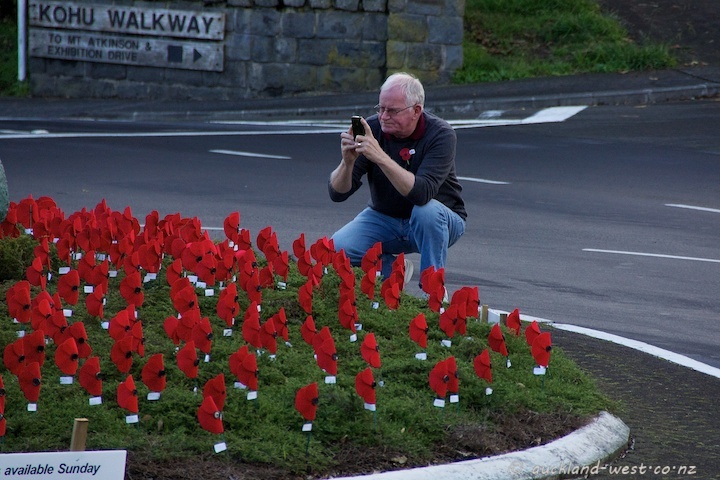 Titirangi Roundabout presented itself in stunning red on yesterday’s Anzac Day: covered in oversized red Anzac poppies with a peace flag attached. Signs indicating “poppies avalable Sunday”. 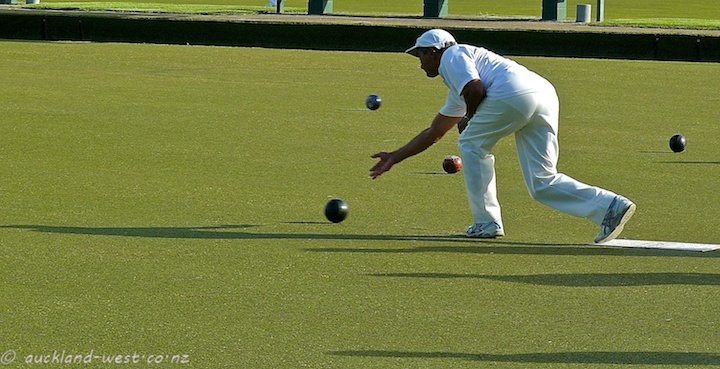 A compelling sight for every photographer. 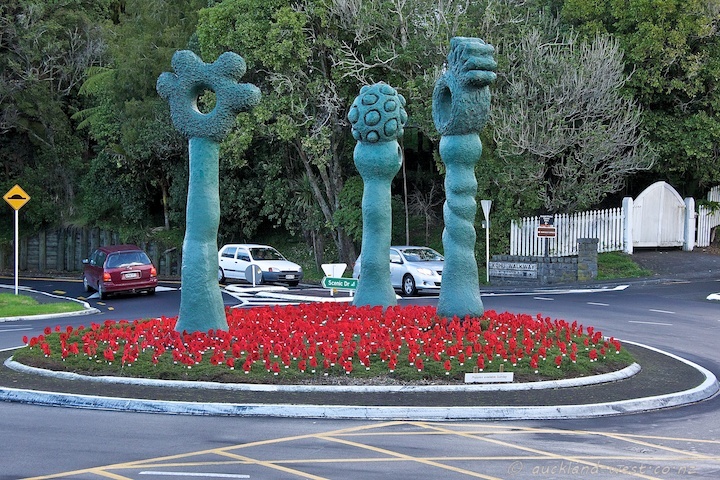 “Visit the Titirangi roundabout on ANZAC morning to see artist Cristina Beth’s Peace Poppy installation. 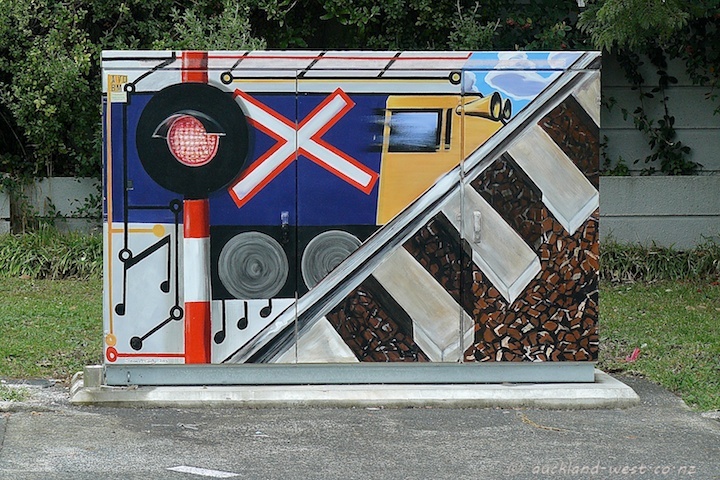 This artwork is for everyone in the community to enjoy and will become part of the landscape for three days. Afterwards the poppies will be given away, and people will be asked to pass on an act of peace/kindness and email back this to the artist to be documented into an art book. Red poppies just like the one on the wall grace many a buttonhole from Friday before Anzac Day (25/04). 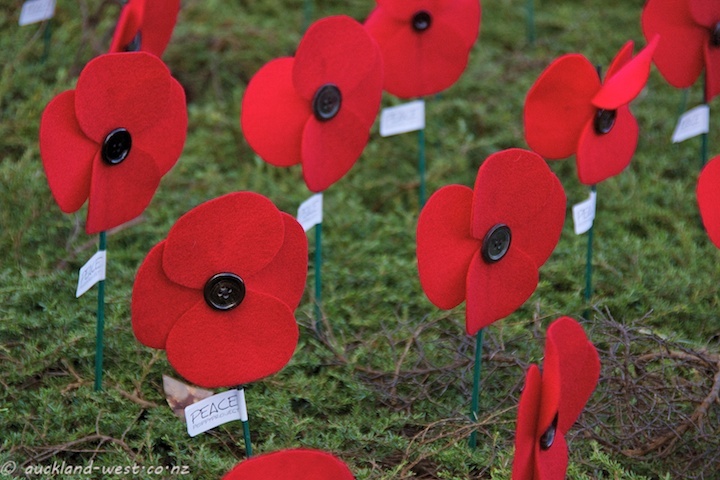 They symbolise the poppies of Flanders and commemorate soldiers who served and died in military conflicts. 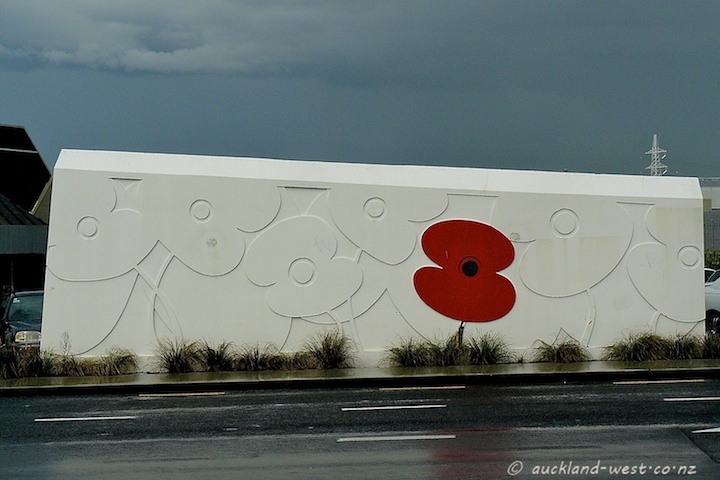 This poppy wall used to be located by Memorial Square around the corner, but in the course of the development of the Merchant Quarter it was relocated to its present place in the grounds of the New Lynn Memorial RSA. 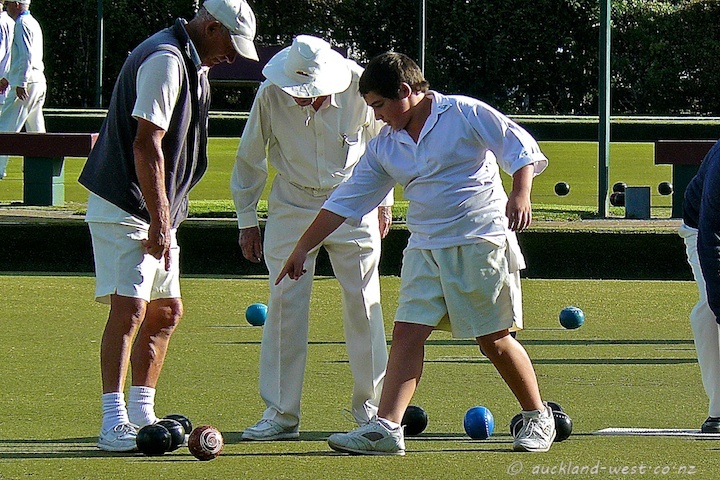 I passed the Henderson Bowling Club on a walk by Opanuku Stream. The City Daily Photo community has a theme “St George’s Day” with great latitude on its interpretation: “You are welcome to post on your ideas on this day, your ideas on National Days and their value, even your favourite footie team.” This contribution has probably one of the more tenuous connections to St George or his day… For more contributions go to the theme day site. April 22, 2013 / paul / Comments Off on Let’s Go Fishing! 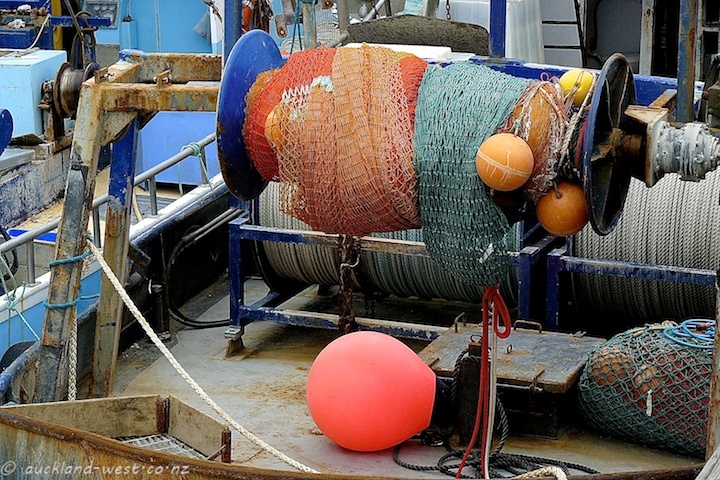 Colourful fishing gear aboard one of the vessels at the Wynyard Quarter. A steady stream of heavily laden trucks, mostly with trailers, move slowly out of the hole that extends from Maioro Road to Alan Wood Reserve. 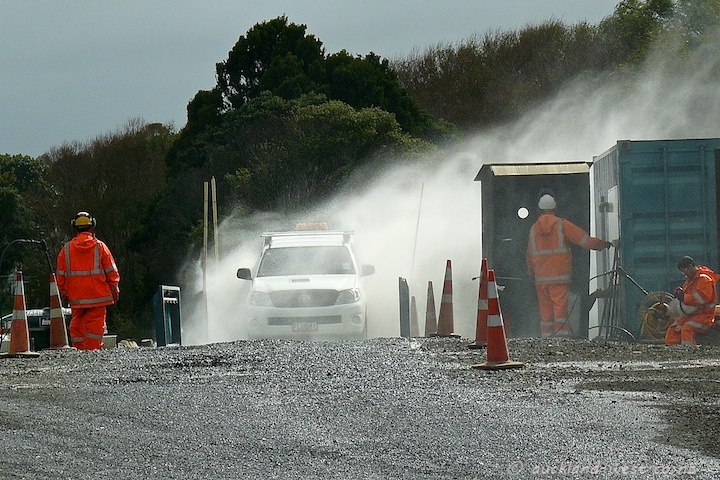 To keep the roads clean, especially after the rain we had recently, they have to cross a wash barrier, with additional custom waterblasting to ensure cleanliness. 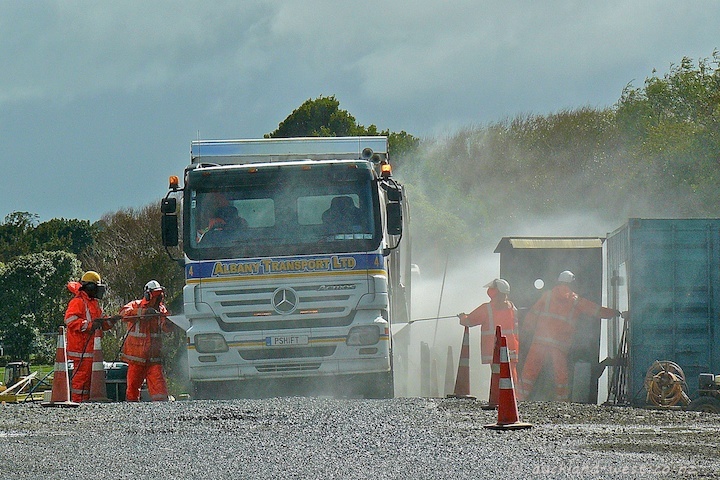 The result is exemplary: clean vehicles and clean roads! This is the southern end of the tunnel about to be dug for the extension of State Highway 20.